The archipelago of Lofoten is known for spectacular mountains along an island chain jutting out into the Arctic sea in the north of Norway. Mountains rise to 1000m above the sea, and are surrounded by small clusters of habitation and the infrastructure of centuries of fishing. Long recognised as an established centre for rock climbing, more recently the area has been gaining popularity as a ski and splitboard touring destination. There’s a huge range of great touring on all the islands, with the majority on the eastern island of Austvagoya. This trip is ideally suited to all levels of splitboarders as the terrain is very varied. 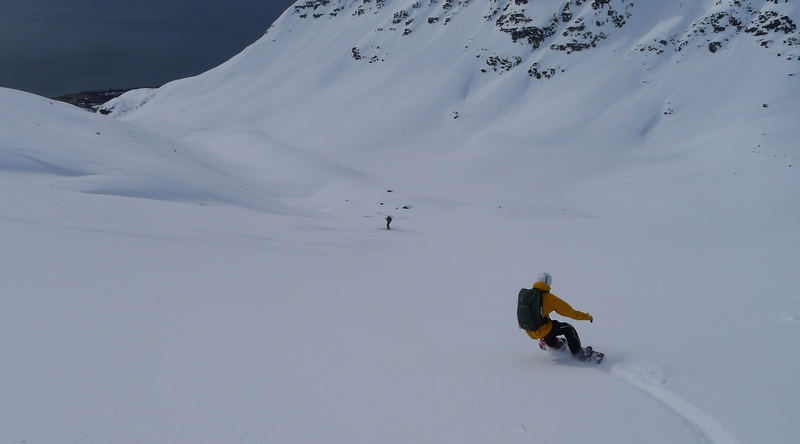 You will need your own splitboard and personal safety gear as there is none available to hire in Norway(although hire kits can be arranged in the UK). It’s not suitable for solid boards with snowshoes or any other kind of snowboard touring set up though. Fitness wise it’s moderately demanding in that the ascent times are not long so in a day we may do two short climbs as opposed to one long one, so it’s easier to opt out of a second ascent if you’re after an easier day. Access is by air via Oslo, to Harstad/Narvik airport and then for 3 hours by road to Kabelvag, on Austvagoya, which is our base for the week. Transport from arrival at Harstad/Narvik airport (Evenes) will be by minibus. Easily accessible day tours are within a short drive, local amenities close by and the snowy mountains and beautiful coastline are a stunning backdrop. The accommodation is in beautiful, classic ‘rorbu’ style fishermen’s cabins. For this trip all food and meals will be provided by our in house chef and professional photographer, Yvan Cohen. The cabins themselves are warm and stylishly modernised to provide really comfortable places to relax after a day out in the mountains. What will my week involve? Amongst the steep and spectacular mountains, there is plenty of really enjoyable touring for all levels and abilities, on some fantastic peaks. More straightforward mountains such as Varden or Pilan offer wonderful outings on mostly lower angle slopes. More challenging terrain can also be found, such as the classic and steeper South Gully on Geitgaljetind . Most ascents are around 1000m with the chance to extend if needed. In the event of bad weather there is even the chance to try Arctic surfing at the surf centre at the beautiful beach of Unstad – very thick hooded wetsuits and surf lessons available! Included in the cost is transfer to and from Harstad /Narvik airport, all travel around Lofoten by minibus, all twin-share accommodation in beautiful fjord side rorbu-style houses and meals for 7 nights, and guiding by Ric, your IFMGA Mountain Guide, for the week. Excluded from the cost is air travel to and from Harstad / Narvik, insurance, personal spending and any extras such as boat taxi or surf lessons!